You will likely recognize the sound of the oboe when you hear it in classical music. Like the flute, the oboe produces sounds by causing a column of air to vibrate. But instead of a hole to blow across, the oboe has a reed to blow into. Still life: Oboe, with reed. If you were an oboe player (or a bassoonist), you’d spend much of your time making reeds. Yes, actual reeds, sliced from the wall of a cane stalk. Talk about low-tech. Almost all oboists make their own reeds. Reed-making prowess is considered as much a requirement of the job as the playing itself, whereas the mastery of reeds isn’t an essential component of the basic performance technique of, say, maracas. In fact, each oboe player’s individual taste in reeds determines the kind of sound that she produces. Oboists usually keep several reeds available at once, and they save the best ones for special occasions, such as important concerts and hot dates. 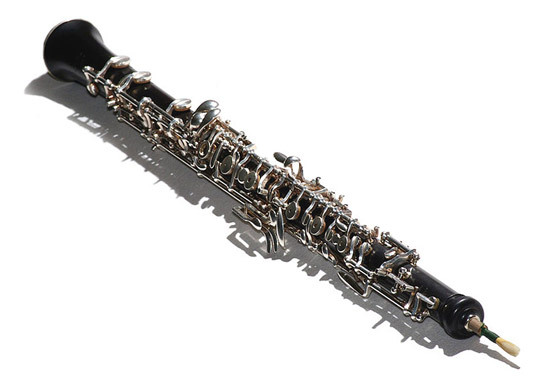 Here’s all you need to know about the oboe — unless you’re an oboist, of course. Insert a newly whittled reed into the end of an oboe, making sure that the reed is moist. The reed must always — repeat, always — be moist. Place the end of the reed between your lips. Your lips control the vibrations of the reed as you blow. Now, depending on how many years you’ve studied the oboe, you may not get any sound out of the thing at all. The oboe is one of the most difficult instruments to play. It ranks right up there with the trumpet as the instrument with the most discrepancy between its sound when played badly and its sound when played well. When played by a beginner, an oboe sounds something like a raucous, nasal duck being boiled alive. When played by a virtuoso, the oboe produces one of the most beautiful sounds on earth: clear, vibrant, sweet, plaintive, and full. Check out the famous oboe cadenza in Beethoven’s Symphony no. 5 (Track 04; 4:37). Johannes Brahms: Violin Concerto (second movement) — really! Right at the beginning of the second movement of this violin concerto is the nicest oboe solo you could ever hope to hear.